Put the agar powder and grape juice into a small saucepan and let the agar hydrate for 2 minutes. Peel the grapes if you want, and divide them between four 4 ounce ramekins. 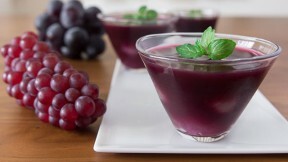 Whisk the grape juice mixture to disperse the agar and then bring the mixture to a boil over high heat. Continue to boil for 3 minutes. Divide the mixture between the prepared molds and let them cool a bit before placing them in the refrigerator to chill.